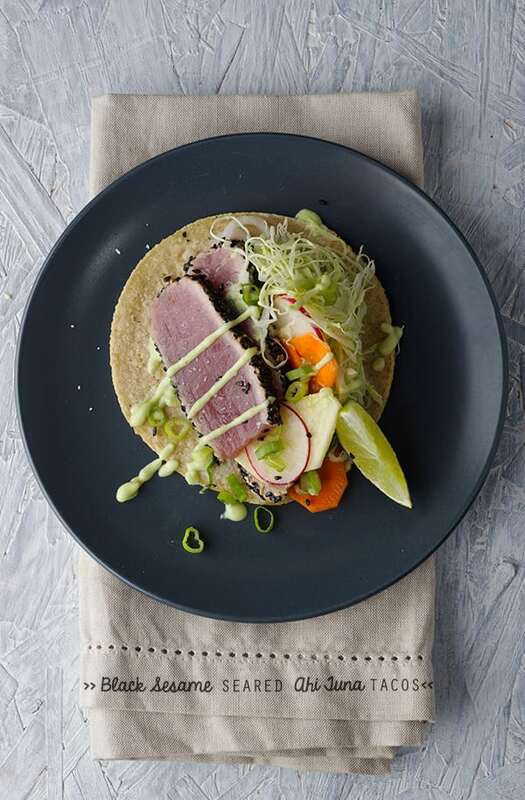 Black Sesame Seared Ahi Tuna Tacos ~ Yes, more please! 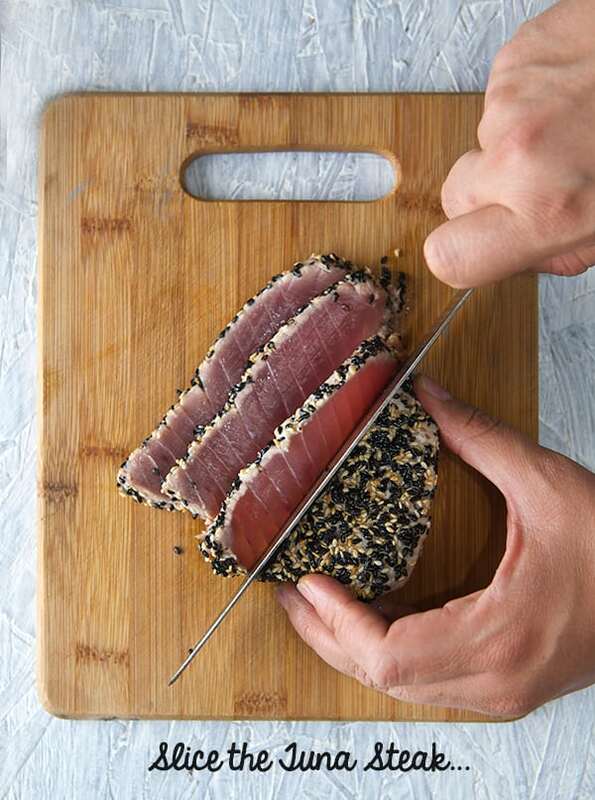 If you never seared tuna before, it is really easy, hot saute pan, rippling oil and counting 20 seconds per side, just follow step number 4 on the recipe. You will have the best succulent seared Ahi Tuna steaks. 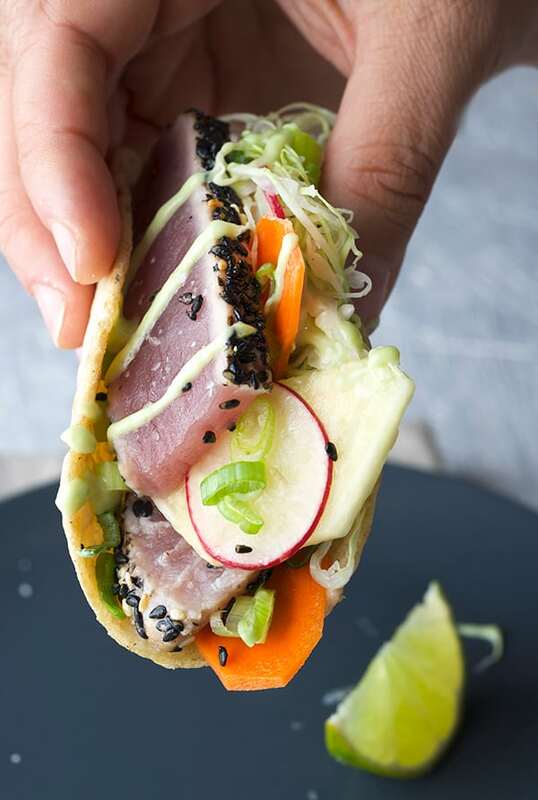 The black sesame seed crusts it what makes the whole different story on this taco. 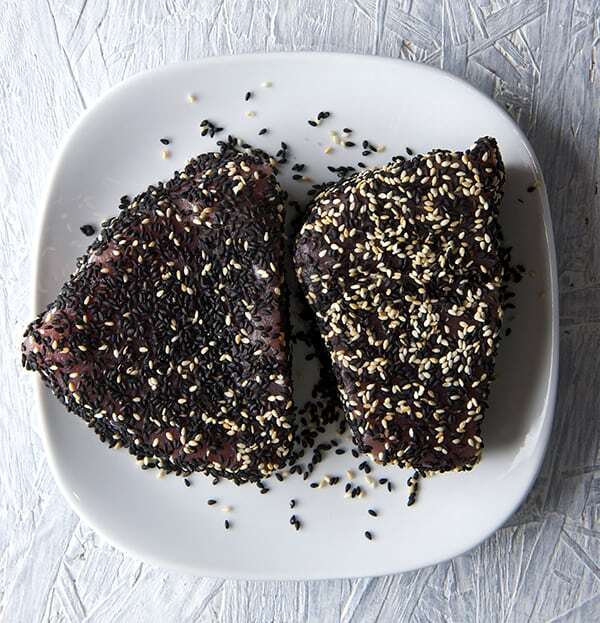 Black sesame seeds add flavor and texture to this lean flavorful meaty fish. When the tuna steak hits the hot pan, the sesame oil creates a nutty and unctuous exterior coat, while the inside of the steak still pink, tender and fresh. 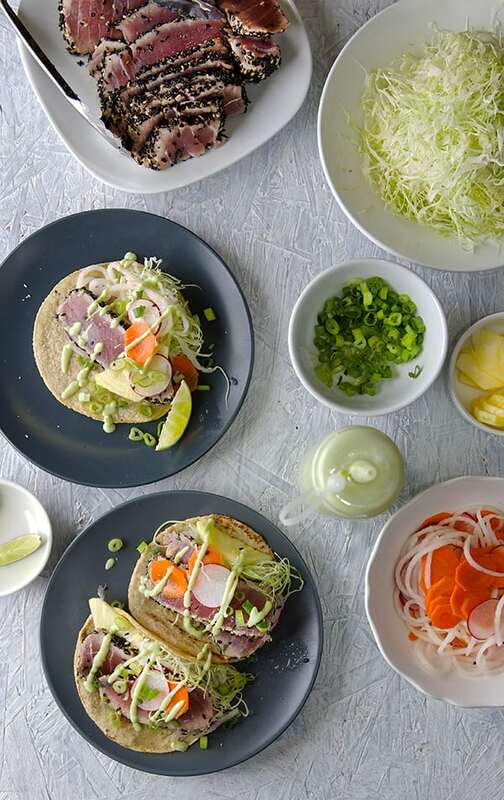 Now imagine this delicious Ahi tuna slices over a handmade corn tortilla. Add the following accouterments; finely shredded cabbage, quick pickled radishes, carrots and jicama for crunch and texture. Fresh pineapple slices, a squeeze of lime for a sharp acid note, and an avocado-wasabi mayo that adds creaminess and spice it up. Do you read what I mean? Taco catharsis warrantied. 2- 1 1/2″ Ahi Tuna steaks fresh, sustainable, best available in your area. 1 tablespoon Sesame oil + 1 tablespoon grapeseed oil for searing. 3 Scallions, finely chopped only the green parts. 1 small Jicama or Daikon Julienned or spiralized. ½ large Avocado Hass, or one small one. 1 tablespoons water or more if necessary. 1-2 Teaspoons wasabi powder. Add one teaspoon at a time and taste, upon your preference. There is different wasabi brands, some stronger in flavor than other ones. Mostly all of the more affordable ones are made with dry horseradish powder, since they are “similar” in flavor. Feel free to substitute for a big tablespoon of horseradish if it is more convenient for you to commit to buy a more common ingredient.Need more heat? add half of serrano pepper. 1. Make your pickled Vegetables. Warm up the rice vinegar, add sugar, salt until dissolved. Add this pickled solution into the sliced vegetables. Let it macerate for 20-30minutes. 2. Now make the Avocado-Wasabi Mayo. 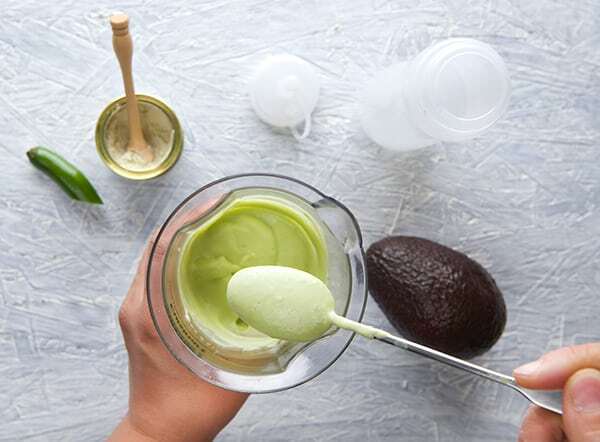 On a blender or using a hand blender, combine the avocado, rice vinegar, water, salt, mayo, and wasabi powder until smooth and creamy. Place into a squeeze bottle for a easy pouring. Set aside. 3. With a paper towel pad dry the Ahi Tuna steaks. Then brush the steaks all sides with rice vinegar. 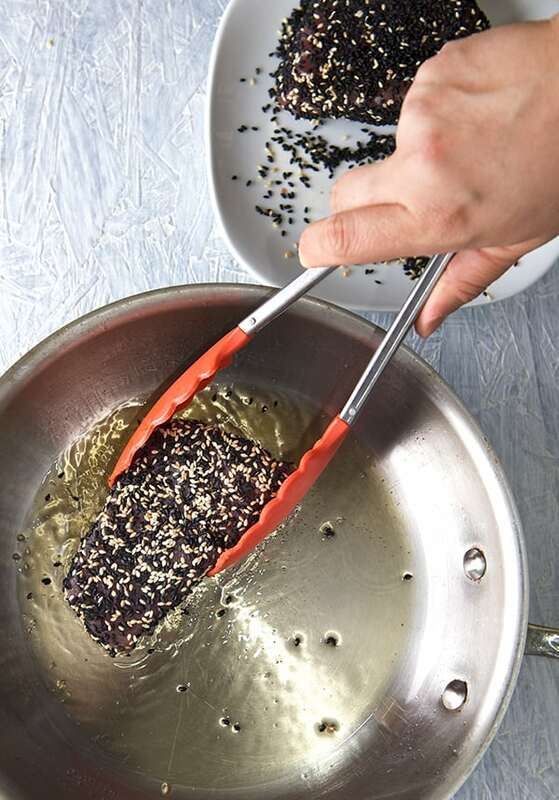 On a flat plate, place the black sesame seeds and place the tuna steaks gently pressing all sides until all covered. 4. On a medium-size saute pan add the sesame oil and grapeseed oil. Swirl until combined. Heat the pan on medium high. Once the oil starts rippling, add one steak at a time. Count 1 minute per each side of the Tuna steak and about 40 seconds to sear the edges of the Tuna steak. Remove from heat, place on a clean plate. Proceed the same way with the other Tuna Steak. This timing will give you a great crust, with a nice pink juicy center. See photo below. Double the time up to your desired doneness. 5. On a clean board, using your sharpest knife, slice the Tuna Steak across the grain into a 1/8” of an inch slices. With your hand press the sides of tuna steak slightly as you slice, for an easier and cleaner cut. Set aside or live on the board. 6. Heat up your tortillas or if you want o make your corn tortillas check our recipe and how to make them here. 7. 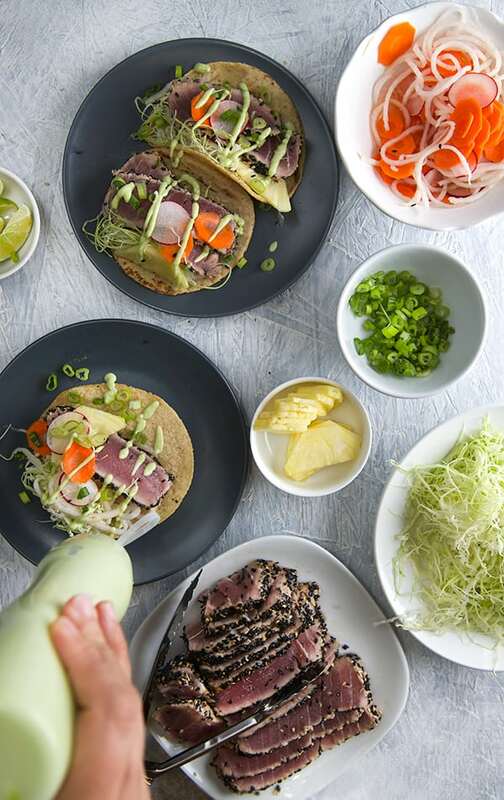 Gather all your ingredients, assemble your tacos, place 2 slices of seared Tuna per taco, the desired toppings and a good drizzle of the Avocado-Wasabi Mayo. A squeeze of lime. Action! Bite immediately. 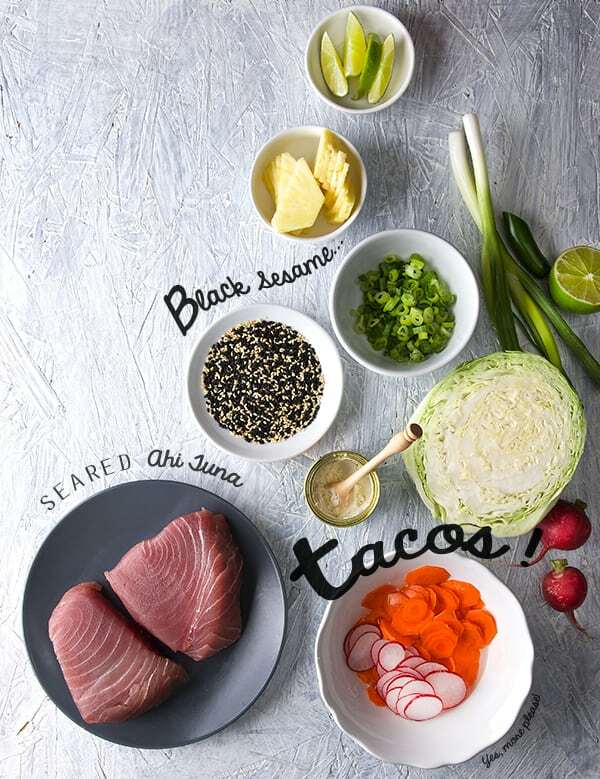 These Black Sesame Seared Ahi Tuna Tacos are my new Summer growling. Make them, you will certainly love them as much as we did. If you want to know more about the dreamy Ensenada, Tacos and practice your Spanish, please check this link here.